This study consisted of an evaluation and redevelopment of first year laboratory experiments in a first year chemistry course at a medium-sized Australian public university, with respect to the teaching methods implemented. The teaching approaches focused on were expository, guided inquiry, and problem-based and these were applied to two physical chemistry experiments. The aims of this study included investigation into the engagement and input of both students and demonstrators, the understanding achieved by students through completion of the laboratory experiment, and the enjoyment of students in participating and completing the laboratory experiment. 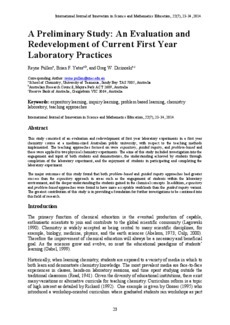 The major outcomes of this study found that both problem-based and guided inquiry approaches had greater success than the expository approach in areas such as the engagement of students within the laboratory environment, and the deeper understanding the students gained in the chemical concepts. In addition, expository and problem-based approaches were found to have more acceptable workloads than the guided inquiry variant. The greatest contribution of this study is in providing a foundation for further investigations to be continued into this field of research.